If you want a good debate, just ask a group of pundits about the size and profitability of Amazon(s amzn) Web Services then sit back with some popcorn. There are two main schools of thought: One holds that AWS is a business with razor-thin margins that is underwritten by the Amazon retail juggernaut and should that business take a tumble, AWS will fall with it. The other holds that Amazon makes good dough off of AWS, and that it could be a viable standalone business unit. Count Macquarie Capital in the second camp. 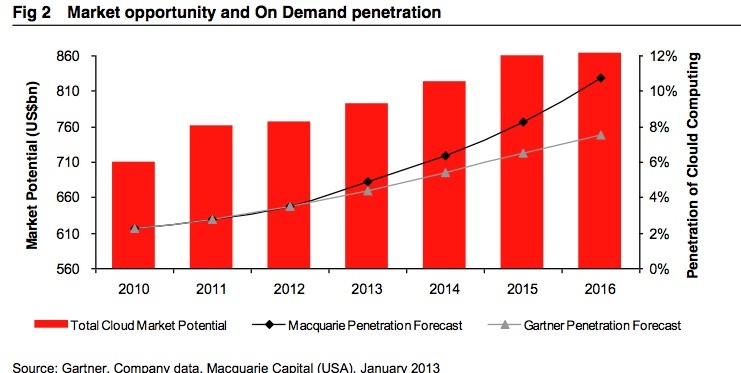 In a new research note, Macquarie estimates that the overall cloud market will hit $71 billion in 2015 and pegged AWS’ addressable part of that market at $38 billion. Those numbers are considerably larger than Gartner’s(s IT) previous estimates of $56 billion for the overall cloud market size and $28 billion for AWS’ piece of the pie. In the note, analyst Ben Schachter said AWS could now be worth $19 billion as a standalone entity, based on a 5X multiple of Macquarie’s 2013 AWS revenue estimate of $3.8 billion, or $30 billion using an 8X multiple. Of course all of these estimates are based on analysis of numbers that Amazon doesn’t provide. The company lumps AWS revenue in with “other” revenue from marketing and promotion activities, other seller sites and co-branded credit cards. Given that, AWS remains pretty much a black box, but I would be willing to bet, all of Amazon CEO Jeff Bezos’ talk of low-margin, high-volume business aside, that Amazon is not doing cloud services as a philanthropic exercise. My understanding that (unlike Amazon’s main retail business) AWS was never a “low-margin” operation with returns on or around 30% to be gradually reduce as and when competition takes place. Why would AWS operate at “book” margins when they’re the biggest and best initial offering in town? Harvest what you can and incrementally reduce prices as competition becomes available to both remain competitive and raise the cost of entry to newer Cloud providers.